Good question. Before I give you the answer, let go’s back in time and let me give you some history on how Unique Blog Designs got started. It was July of 2007 – I had been blogging for a solid 5 months and had built up a solid base of 500 RSS subscribers through consistent and informative blog articles. My previous experience in web design led me to consider the benefits of starting a blog design company. Anyway, one particular summer afternoon, it was 100+ degrees outside, and I was at the pool with my good friend and biz partner, Matt Blancarte. We were talking about how insanely popular blogging was becoming, at such a fast rate. At that time, there were over 100,000 new blogs being started everyday. (I am sure that number is WAY higher now). The problem was that 99.9% of people were using free themes, which, of course, all looked extremely similar and did not represent the author’s brand and originality. Even our favorite blogger at the time, John Chow, was using a slightly customized version of the MistyLook theme. Essentially, with so many new blogs popping up each day, it was quite clear that there was need to appear “unique” in the blogosphere. It was in this thought that the concept of Unique Blog Designs was conceived. That same day, I rushed back from the swimming pool to my apartment to check to see if the domain uniqueblogdesigns.com was already registered. Incredibly enough, it was available and I immediately registered it. That was July 8, 2007. One month later, I wrote a post entitled “23 Things I’ve Learned After 7 Months and 500 RSS Subscribers” that ended up being linked by none other than John Chow. It was at that time that I began casually chatting with John on IM. Inspired by the recent ProBlogger redesign, it was at this time that John and I decided to work on a new blog design his blog. This was an opportunity to place special emphasis on some key conversion elements of his blog, such as RSS subscription and advertising. 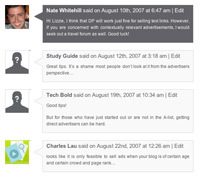 On August 22, 2007, Unique Blog Designs launched with the redesign of John Chow dot Com. At the time, John had approximately 7,000 RSS subscribers and was earning ONLY $17,000 per month. As I mentioned, we decided to place extra emphasis on his RSS subscription options, advertising placement, and his “make money online” ebook, which allowed him to collect a targeted group of email addresses from people interested in making money online. What did John have to say about his theme after several months of use? 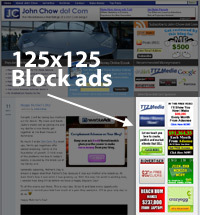 By placing two rows of 125×125 block advertising buttons on his sidebar, John was able to instantly gross and extra $8,000 each month from his blog. Block advertising is one of the most effective ways to monetize a blog – you can see it in action on monster blogs such as ProBlogger and TechCrunch. By the end of 2007, John was earning over $25,000 per month, and that number is now closer to $30,000. Not only that, but by including direct links to his preferred affiliate programs (a.k.a “Recommended Moneymakers”), he begins earnings commissions for all of his network referrals. As if that is not enough, John’s RSS subscribers have more than tripled from 7,000 subscribers in August of 2007, to almost 25,000 subscribers currently. 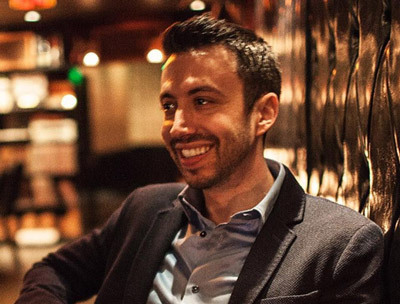 After launching John’s blog, one week later, we were contacted by another top 100 “make money online” blogger, Jeremy Schoemaker. A week later, we launched the redesign of Shoemoney.com and the rest was history. Not surprisingly, after designing blogs for two of the most renowned bloggers, we received a lot of traffic (and orders) for new blog designs. As I mentioned before, my previous theme was a free theme, but I added several customized elements to it, including a header graphic, featured elements and especially RSS subscription emphasis. Maintain similar color scheme to previous design. I believe this is an important thing to take into consideration when redesigning a blog with a relatively large number of readers. I have enough of a readership where I think maintaining a similar color scheme is necessary in order to not confuse new and existing readers. Maintain similar layout and “feel.” This is also related to my philosophy of “don’t fix what’s not broken.” My previous blog design received a lot of positive feedback and several people even contacted me wanting to purchase the design as I had customized it. Unique display of RSS subscribers.” Are you just as sick of the Feedburner chicklets as I am? Luckily, there is a WordPress plugin called Feedcount which allows you to grab your RSS feed count directly from Feedburner’s API. Just to give it some fire, I added the Feedburner fire icon. Way cool. Widen the layout. My old design had a width of 780 pixels in width which is quite narrow for many of the monster 22″+ displays nowadays. This new design is 900 pixels wide, which fits perfectly even on a 1024×768 screen. Make the design even EASIER to read. One compliment I frequently received on my previous blog design was how readable it was, and that is something I had place importance on in the past. Unique comment layout and design. As much as I love threaded comments, I like Gravatar support, highlighted author comments, and cool looking comment boxes even more. I am proud to announce a cool new commenting layout with integrated Gravatar support. Just so you know, Automattic, the company that owns WordPress, bought Gravatar late last year, so we will be seeing a lot more of Gravatar in the near future. That’s great news to me, because I think Gravatars are a lot cooler (a.k.a. higher res) than MyBlogLog avatars. 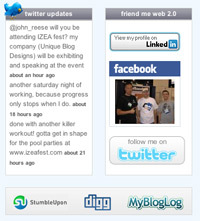 Increase the sphere of influence by integrating my social media buttons. Social media is the next evolution in online brand building. I have blogged a lot about branding in the past and how a blog is an incredibly powerful way to develop a personal or corporate brand. Another emerging brand development tool is becoming participation in various forms of social media and networking. I am talking about Facebook, Twitter, Digg, LinkedIn, StumbleUpon, etc. Although it may seem futile to some people, by having more followers, or “friends” on different networks, these are simply other opportunities for people to find common interest with you and possibly participate in your community. Not only that, but many of these sites can drive targeted traffic to your blog, because these are already people who have chosen to “friend” you on given networks. Many bloggers are beginning to integrate their social media buttons on their blogs as to increase their sphere of influence. MostlyLisa is a great example of someone who has leveraged social networking to increase her sphere of influence, and of course, pageviews, which equal advertising dollars. For example, by frequently posting her videos to Viddler, she is able to send her blog a tremendous amount of traffic as her videos typically receive 10,000+ views within a few days. In summary, social media is your next opportunity to increase your sphere of influence. I draw the line at Myspace, but feel free to add me on any of the various network icons you see on my blog. I hope you like the new look of Nate Whitehill dot Com. Over the past year and a half, my blog has become the most important networking, branding, and business tool in my life. If it were not for my blog, there would be no Unique Blog Designs or any of the other dramatic life changes which I have experienced over the past year. Time to get black to blogging! P.S. – Happy Mothers’ Day 2008! I love you, Mom! New theme is much better. Previous Previous post: PageRank Update Underway? Next Next post: What Is The Benefit of Social Networking?